My daughter and I have been watching a lot of celebrity Sesame Street music videos on YouTube lately, which has been a fun thing for the 2 of us to do together, but whenever I zone out and let my mind wander (as I often do), I always do a double-take when I see my reflection in my computer screen. I look older, my hair has lost it’s shine, I look tired, and thanks to Ben and Jerry, I’m starting to get a double chin. So I spent some time on YouTube the other night, and I was amazed to find out there are lots of ways you can get rid of a double chin without surgery or frequent trips to the gym. And since I know I’m not the only woman out there with this problem, I decided to share the top 5 tutorials I found to teach you (and me!) how to get rid of a double chin without surgery. I was on the fence when I first started watching this tutorial, but it is filled with great tips on how to get rid of a double chin without surgery or makeup. And if you love making your own beauty masks, you will love this even more! I watched a bunch of facial exercise tutorials to help tone loose skin and a saggy jaw, and this is by far the best as Tracy touches on all of them. Oh, and she has a great sense of humor, so she keeps it fun! This is a simple and quick tutorial to teach you how to hide a double chin with makeup. Who knew it could be this easy??! This tutorial uses the same techniques as the one above, but since Brooke actually has a (very) slight double chin, I thought it would be helpful to include this clip so you can see just how effective this makeup trick is. You’re going to love it! I’m not really a fan of enhancing pictures, but if you have a shot of yourself that you’re dying to alter, this Photoshop tutorial will be a dream come true for you. There are so many things you can do with this program, I don’t even know where to begin! 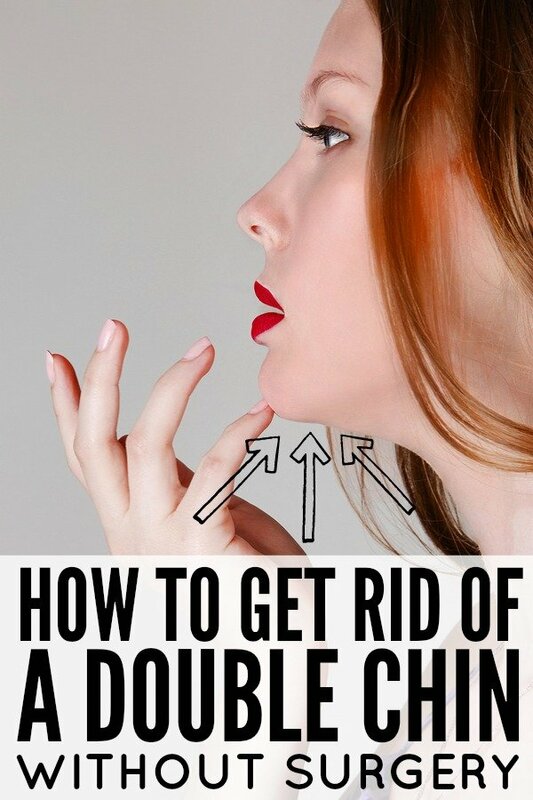 If you found these tips for getting rid of a double chin without surgery helpful, please share them on Pinterest! And if you’re looking for more beauty-related tips to keep yourself looking fabulous, please follow our Beauty board where we share all kinds of greatness!